The Harding tricycle is, frankly, atrocious to ride. The 18″ front wheels are totally unstable and it’s important to keep the steering well serviced, as it’s prone to get to stuck at full lock. Which reminds me of riding my sister’s horse 20 years ago; as we passed the barn where the horse’s food was stored, it decided to turn right while I kept on going forward. Imagine, then, an unstable tricycle with small front wheels liable to jump in the air if it hits a pot-hole. Now add a 32cc engine to the rear so that you can go faster! My only explanation for the folly of the Harding Model C Cyclemaster is that R.A. Harding Ltd were in trouble with the sales of their invalid carriages. Did someone at the company have a brainwave and decide to make a motorcycle so dangerous that it would result in more invalids, to help sell their other products? On the plus side, the machine does have three brakes. All three on the single rear wheel. 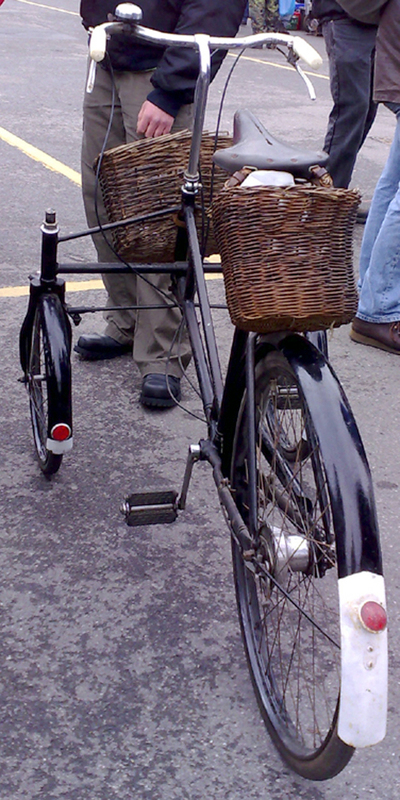 The levers on the handlebars control two brakes on the rear wheel, while the Cyclemaster engine has an additional coaster brake. R.A Harding (Bath) Ltd, 19, Lower Bristol Rd, Bath, Avon. 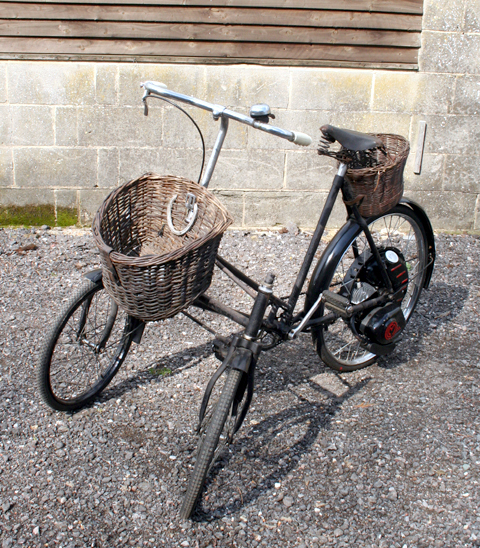 R.A. Harding was a company based in Bath, well-established pre-war as a manufacturer of ‘bath chairs.’ Like Kendrick of Reading, they also dabbled with TWS (Two-Wheeled Steering) tricycles, though the Harding models had 18″ front wheels. 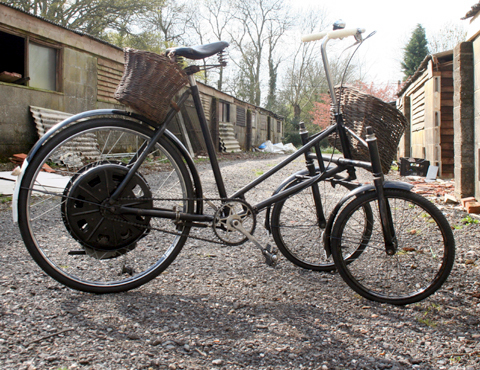 In 1956 they marketed their TWS tricycle with a Cyclemaster engine fitted. The company was established in 1921 by Mr. J. Gordon and Mr. E. Loxley. For the company, they used the maiden name of Mr. Loxley’s wife. In the early years, they made a greater variety of invalid carriages than any other manufacturer. By 1930 they offered 8 different models. They built invalid carriages for the government during WW2, but found it hard to compete with AC when that company moved into the market. 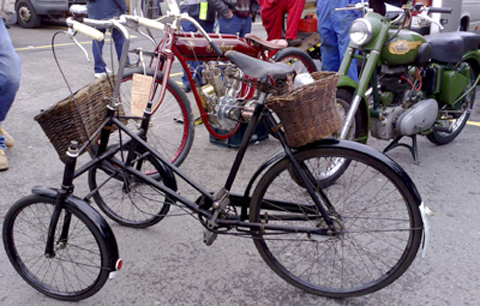 Their motorized tricycles ceased production by the early 1950’s, though their tricycle range continued. 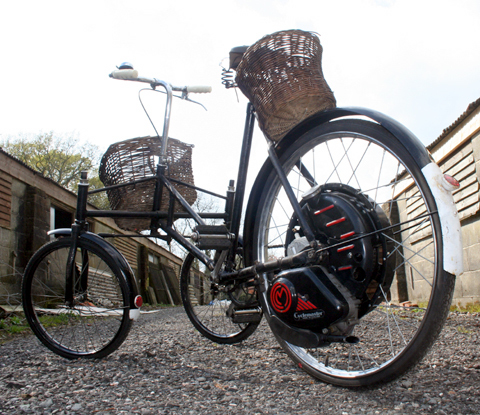 The motorized Model C is simply an ordinary Harding tricycle with brakes and front mudguards. 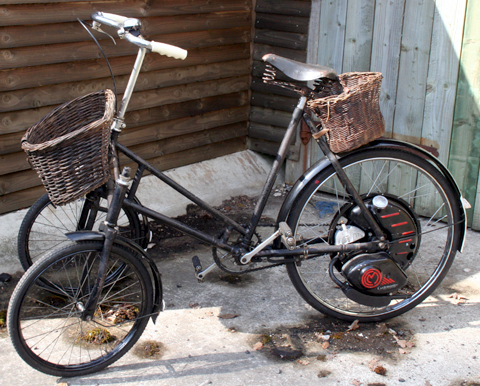 Here it is pre-cyclemotorization, when I displayed it at Kempton Park in March 2008.